Finding a beautiful balance between traditional, contemporary and eclectic principles, this Singapore home boasts more than a few beautiful elements that we simply can't take our eyes off. 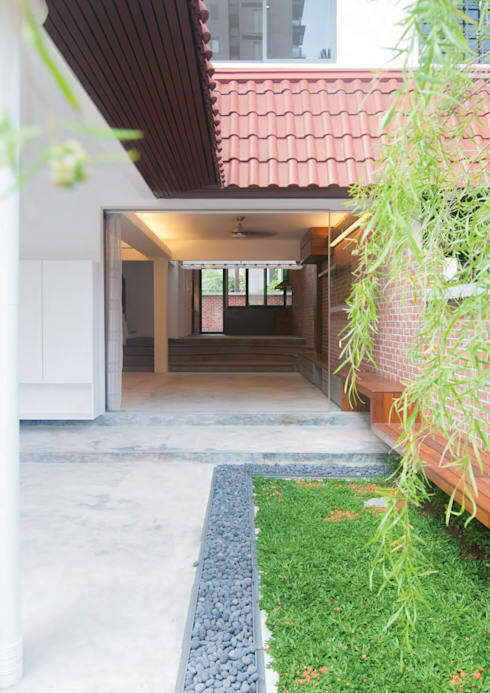 Coming at a cost of S$550,000, the house designed and executed by Quen Architects is a beacon of local architecture, representing not only our traditional flair but our stylish approach to modern themes and styles. The young family calling this space home have adapted to the space with ease, and clearly make use of all rooms in a practical but understated fashion. 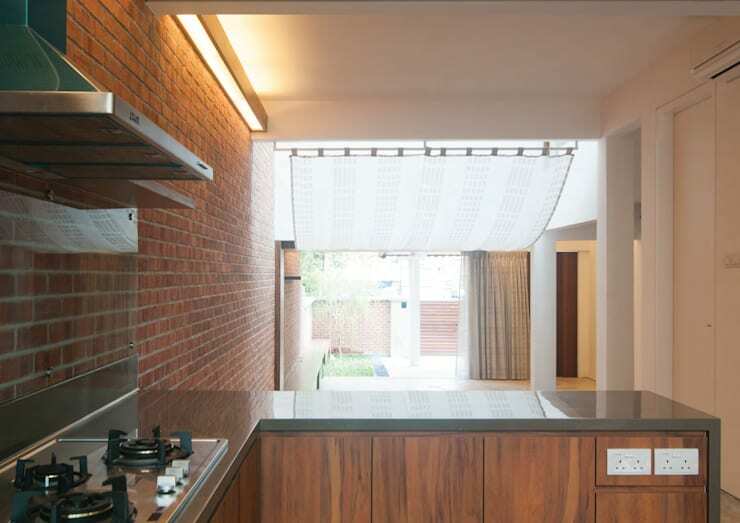 Boasting every aspect of the Feng Shui lifestyle, there is nothing that this house does not achieve; from its structure to the style applied within the interior, it's on-point from every angle. The patio/terrace area of this home is a perfect space to relax. There is nothing more beautiful than looking up and seeing the sky looking back upon us. 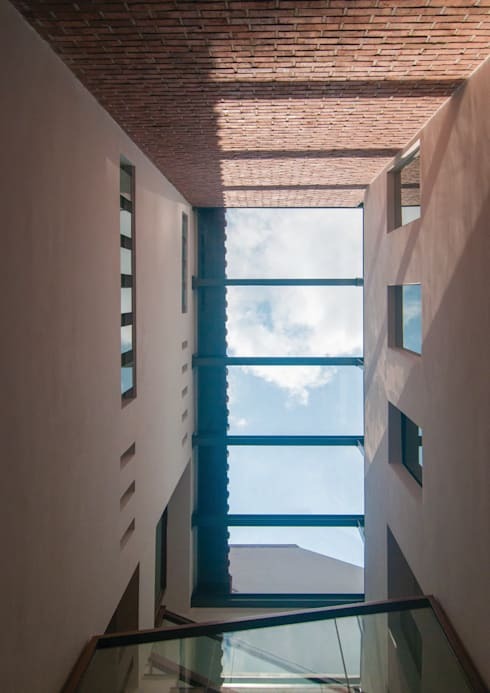 While inside and protected from the elements, the choice of a skylight roof means that natural light is always flowing through. 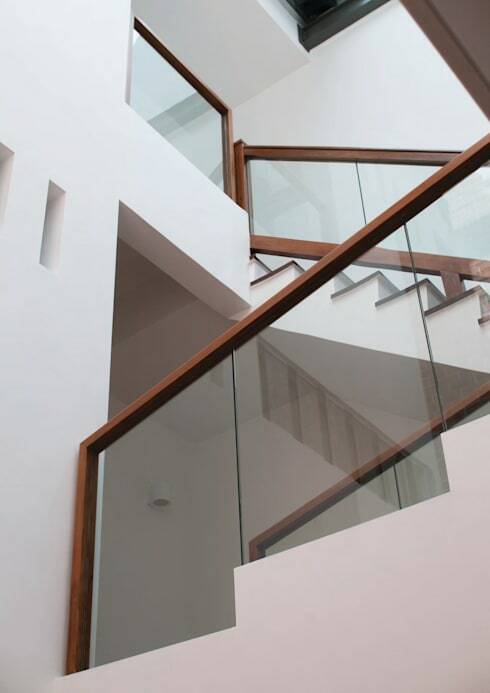 The multi-teared Staircase suggests a somewhat Scandinavian style with the white-and-wood look. Warm and welcoming, the entrance to this home is lit beautifully by the yellow interior lights and is defined by an Asian-meets-modern style of architecture. 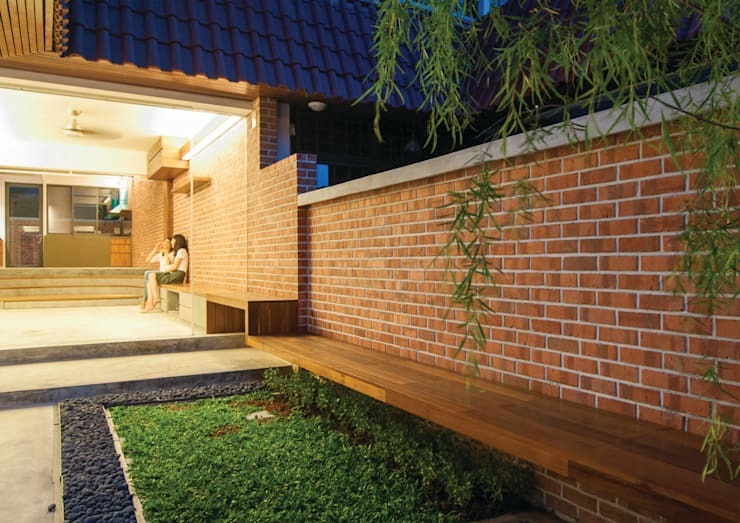 The bench that spans the length of the brick fence is really what brings a sense of relaxation to this space, as it confirms that this is a place for sitting, reflecting and taking a few deep breaths. No home is complete without a kitchen, and this not-too-small but not-too-large example is perfect for this young family. The wooden cabinets also add a touch of 70s style. 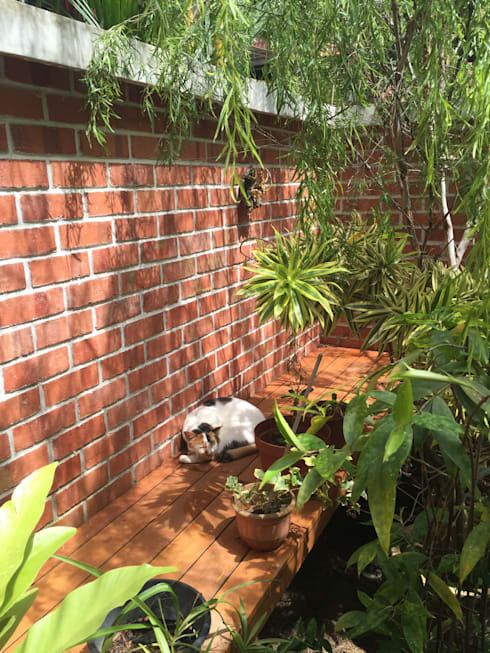 Just as no home is complete without a kitchen, no home is complete without a cat, and this home offers plenty of perfect little places for a kitty to curl up and get cosy. 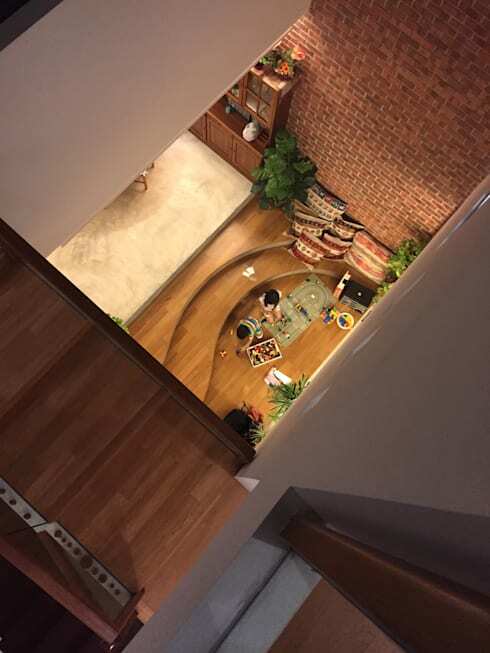 Looking down from above, we get a real sense of how open and versatile this structure is, and how sophisticated the interior architecture is. 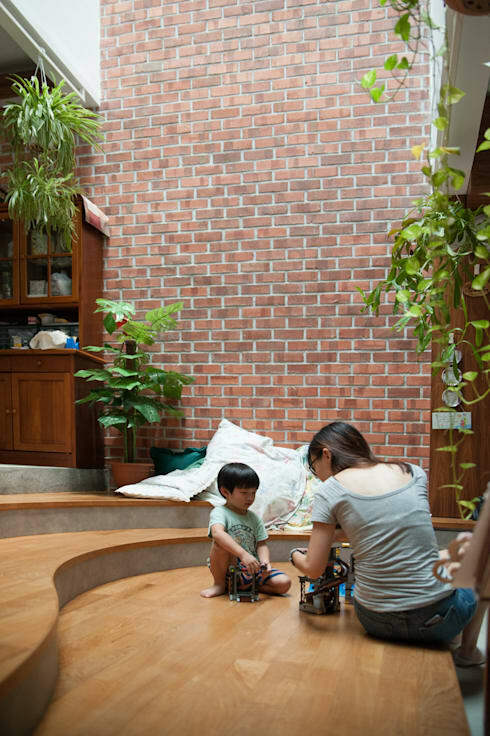 The staircase splitting the half-levels of the lower section of the house makes for a perfect spot to play with the kids. 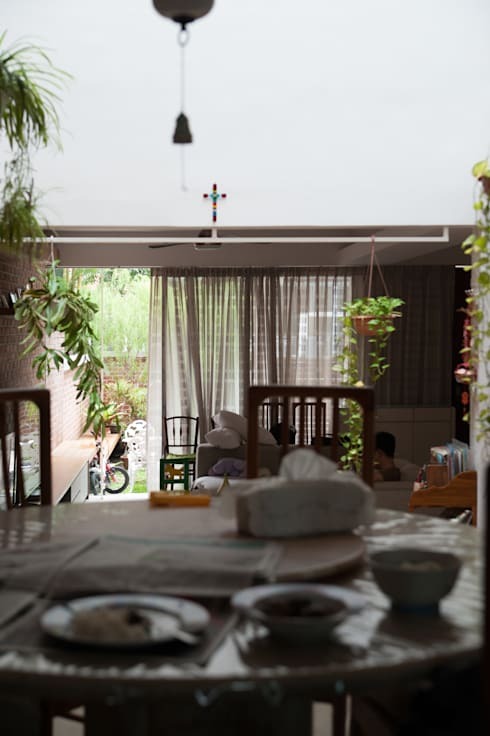 From this angle we can see that the dining and living areas are a bit more lived in, and that the home is as family-oriented as it is stylish. As this is a home of fused influence, the French/Mediterranean table setting in the little yard is the perfect addition. 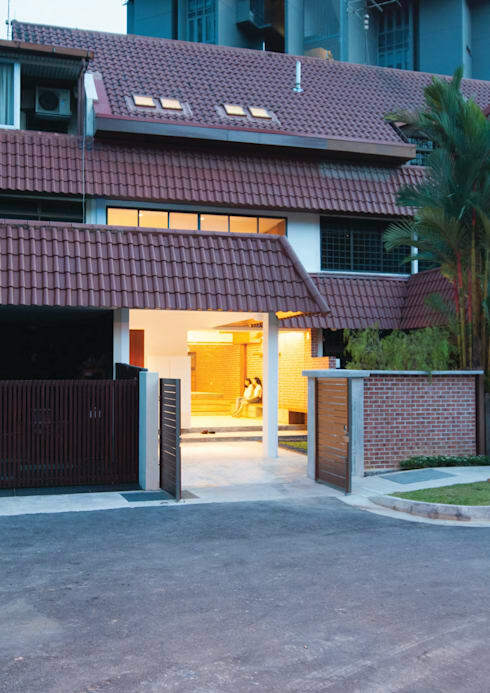 If you enjoyed this home, you might also like to take a look at: The Japanese style Singapore-city-home. 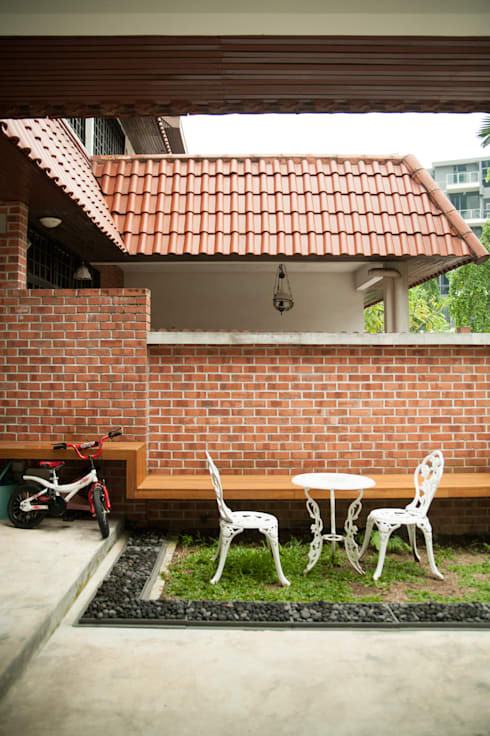 What do you think of this terrace house? Let us know!